The driver is actually a modification of the lirc_serial module. I decided to create a new one separately because I couldn't hack it into the serial nor the gpio driver. The serial driver uses the DCD of the serial port, which is not implemented by the RPi. The gpio driver is created mainly to "talk" with TV tuner cards chip (here the module receives codes instead of pulse signals). The driver is not in the main lirc repository, so the lirc sources must be patched first then the driver must be compiled. To do this you need to get the lirc sources. To compile a kernel module you need your kernel's header files. (I didn't have the time to create a detailed HOWTO for every RPi binary distribution, so if someone could send me one I can publicate it here, so everything can be found in one place). The driver has 5 parameters: debug, gpio_out_pin, gpio_in_pin, sense, softcarrier. The default gpio input pin (PIN12 - GPIO18) is used when no input pin is specified as a parameter. The default gpio output pin for transmission is PIN11 - GPIO17. 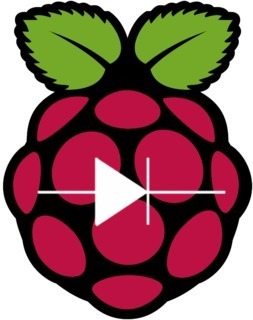 Please consult the RPi wiki page for more information about GPIO pins (here). The driver will use GPIO0, pin 3 on the RPi board as input. Check if the module could allocate the gpio pins. Check dmesg after loading the module with the debug parameter. Run irw then check if the module succesfuly requested an irq. The RPi's processor uses 3.3V levels and the pins are not 5V tolerant!!! Te be able to capture the IR signals I used an infrared receiver that can operate at this voltage (like TSOP 1238). The classic TSOP 17xx and 18xx are unstable at 3.3V and won't work without some kind of level converter (IC, photo diode etc.). As the LIRC manual states: "Most of these receivers come in variations adapted to a specific carrier frequency. You should choose the 38kHz types because most remote control standards use this frequency. 36kHz types should work as well. The receiver won't stop working if your remote uses another frequency but the range will decrease." The "hardware" is as simple as it seems. 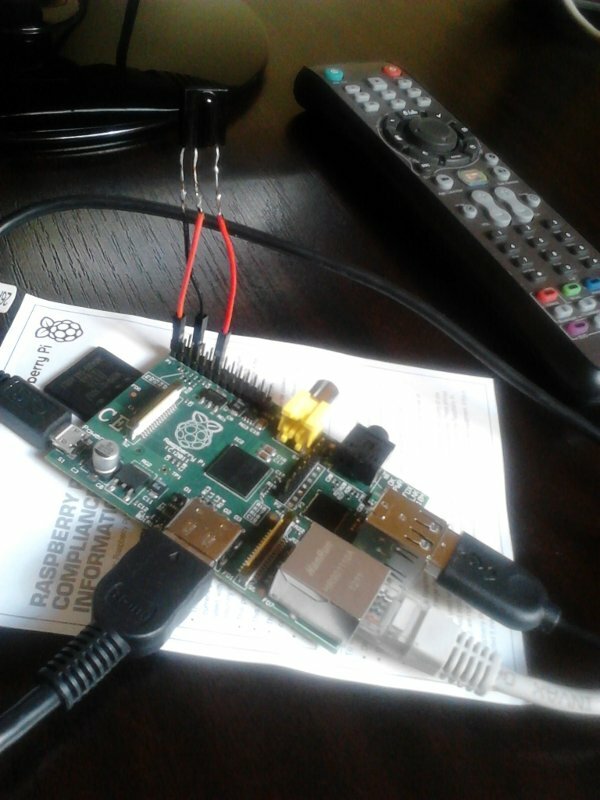 Power the IR receiver from the GPIO and use one of the GPIO ports to pass the signal to the RPi. By default the driver uses PIN12 (GPIO18) this can be configured with the gpio_pin parameter. 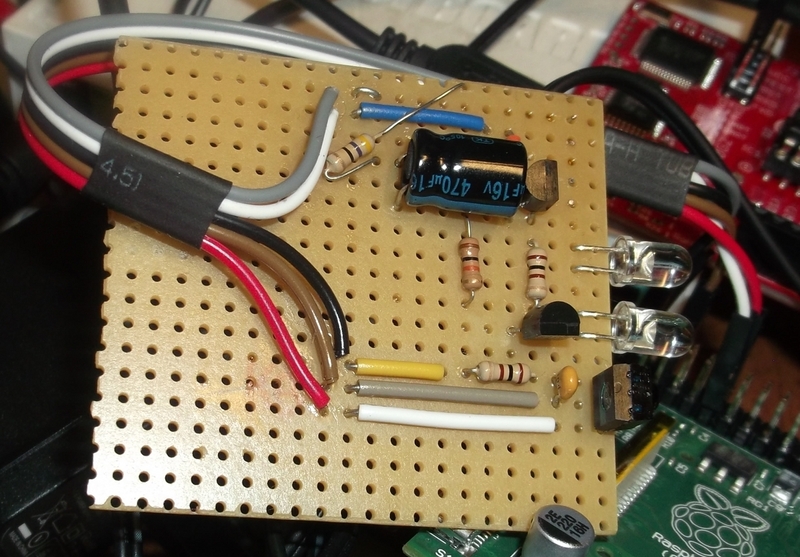 * Current limiting resistor can be added to protect the RPi. Also optionally, a resistor and a capacitor can be added (check the receivers application circuit on the datasheet), but I think (somebody correct me if I'm wrong) it's safe this way. RPi wiki site states: Maximum permitted current draw from the 3v3 pin is 50mA. Actually these receivers draw ~5-10mA so it should be safe to use them this way. *Any kind of IR LED should work (pick one that operates at 940nm peak wavelength), check out the datasheet for power requirements. Also any kind of NPN transistor should work that can forward ~300mA current. 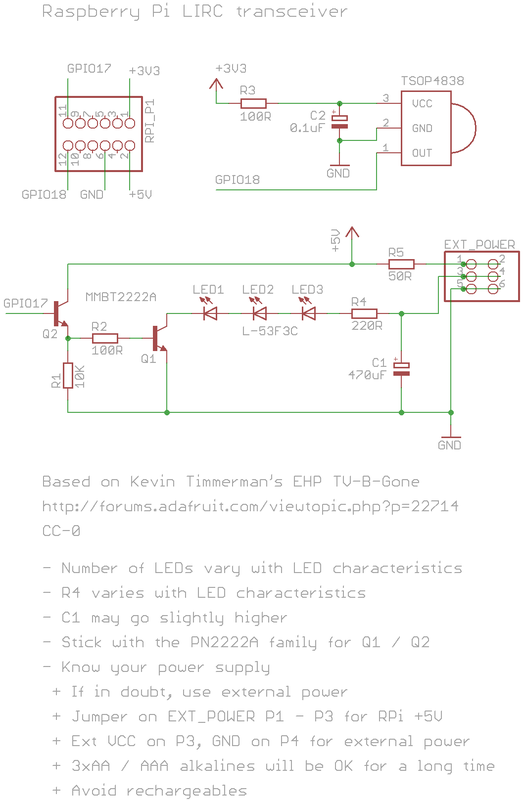 This is only a test circuit, so if you want something more sophisticated (with a better range) take a look at Brian's schematic here (the way this works is brilliant).